As a food obsessed, vegetarian Milton Keyneser there's not really much for me locally. I first discovered Veggie World when I gave up meat about 8 years ago, but then completely forgot about it until I started working with other veggies. I've mentioned before that I get really bad food envy, so after hearing them talking about it, I started trying to convince Scott to get a takeaway with me. Luckily I did managed to convince my vegetarian-phobic boyfriend and although we're quite different people, we do have one thing in common. We're both massive fatties who like to eat a lot! So brace yourself for the long list of food we ordered! 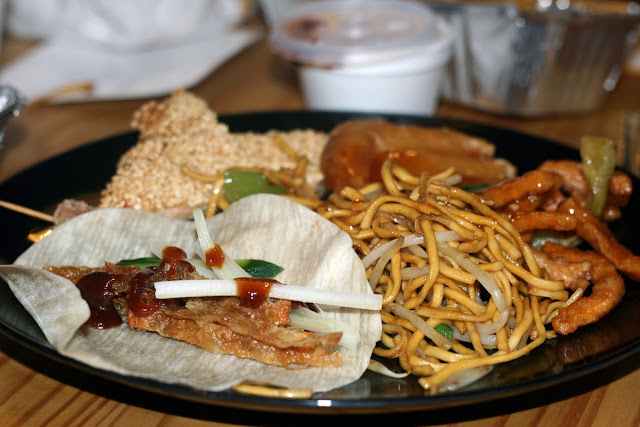 We had prawn crackers, the apetiser combo, vegetable chow mein, crispy sweet potatoes, sesame veggie prawn toast, crispy aromatic veggie duck, crispy veggie chicken balls and crispy chili veggie beef. So yeah, we ate a lot of crispy food and it was so good we pretty much ate it all. Scott even liked it enough to make that face you make when you really like something (accompanied by that noise you make when you really like something). I can't even decide what my favourite part was, I think it might have been the veggie duck. I've had veggie duck made from tofu before, but this was even better because it was CRISPY! I've never eaten real duck but, but I have had pancakes with greens and hoisin sauce before so the little extra crispy just makes it better. If you have accidently stumbled across this blog and are one of those annoying meat eaters that asks 'how can you eat fake chicken if you're a vegetarian' well I'm not usually one for fake meats, but this was a rare treat that actually showed me how good they can be. I remember before I was vegetarian me and my dad always used to have chili beef, and the veggie version took me back to that. The best part was that because it wasn't made of (dreaded) tofu it was something that my boyfriend and I could both enjoy! So if you are ever in Milton Keynes (I don't know why anyone would be) definitely check it out!